Here’s another new one on the market as I learn that Paul Daubner at Northrop & Johnson has signed the 37.2m motor yacht Shogun for sale. Built in aluminium by Flagship in 1993 to a design by Overing, Shogun was refitted in 2005. Accommodation is for eight guests including an on-deck master suite and twin 1400hp Caterpillar engines give her a cruising speed of 11 knots and a range of 3,000 nautical miles. 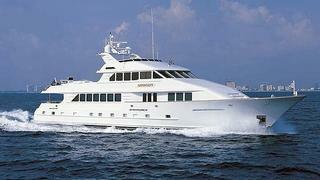 Lying in Newport Beach, California, Shogun is asking $4.5 million.